David was a musician extraordinaire. 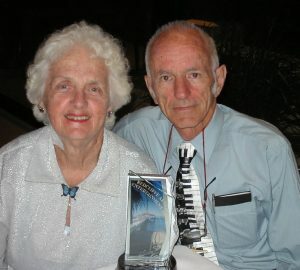 Born in Adelaide, David lived and worked in various countries including Canada, USA, French Polynesia, Fiji and New Zealand, and finally Australia, where for six years he was Schools Manager for the Yamaha Music Foundation, before settling in Redcliffe in 1996 with his devoted wife Shirley. A philosopher, progressive theologian, linguist, classical and jazz musician, and an all-round really nice guy, David was well-known in many circles, particularly around Redcliffe where he was a dedicated promoter and practitioner of musical culture over many years. As a member and Vice-President of the Moreton Bay Arts Council, he helped organize the highly successful Moreton Bay Arts Festival in 2009 and the Seniors Week Festival of Choirs in 2014. He co-founded the Redcliffe City Orchestra’s Jazz Ensemble, and in collaboration with Joan Wilkie, another well-known musical identity produced and regularly performed in the much-appreciated musical series Mid-Morning Melodies at the Redcliffe Cultural Centre between 2009 and 2015. Because of his accompanying skills, he often worked with various vocal and instrumental soloists, choirs, and concert parties. He was awarded Life Membership of the Redcliffe City Orchestra (now the Moreton Bay Symphony Orchestra) and was the orchestra’s pianist for many years. In addition, he was an active member and performer for the Brisbane Theatre Organ Society, a regular accompanist for the Redcliffe City Choir, and organist at his church at Kedron. In another area of interest, David helped establish and was a valued contributor to the progressive/evolving Christianity group now known as the Redcliffe Explorers. He brought with him great wisdom, compassion, good humour and a genuine desire for mutual tolerance and acceptance between different nations and religious faiths through respectful dialogue. One of his favourite songs was Let there be peace on Earth. David was diagnosed in 2016 with terminal and rapid-onset motor neurone disease. However, he refused to dwell on the debilitating disease that attacked him, drawing great inspiration from the American baseball player Lou Gehrig who said that despite the “bad break” he had received in contracting MND, he was the “luckiest guy on the face of the earth”. May we also show strength in adversity from David Judd’s example. David Judd sadly passed away on January 5, 2018. In the words of David and Shirley’s son Ross, ‘The world is a little bit poorer for the loss of someone who gave so much to so many’.